Back in the 1980s you just didn’t get rock music in mainstream media. It was utterly ignored – except for Tommy Vance’s rock show on Radio 1 on Friday nights. in Scotland, rock fans listened to Tommy, then switched to Radio Clyde (the most successful independent station in the UK) for Tom Russell’s show. He’d only been given a six-week trial period when he started broadcasting, but he remembers: “I just kept going in, doing a show and submitting my invoice.” Tom Russell’s Friday Night Rock Show lasted two decades before Tom became the senior presenter on national network Rock Radio, which ran from 2006 until 2012. Now the ex-paratrooper, record shop owner and father of two has written a book, Tom Russell: The Godfather Of Rock, recounting his adventures in rock and metal. And if you think there’s only so much a regional DJ can achieve, his story will make you think again. Here’s 10 reasons why. Along with being known as “The Godfather of Rock” he’s also commonly referred to as “The Beard of Doom.” Slash says: “Of all the people I know in the world with great beards… Tom is definitely one of them.” Although Tom was once mistaken for Seasick Steve at a festival. On a trip to Los Angeles to interview Slayer, producer Rick Rubin gave a young man the keys to his 1957 Chevy and sent him to collect Tom from the airport. As they chatted the driver told him: “I sing in a band and we’re actually auditioning for Mr Rubin.” The next time Tom saw Chris Robinson was on the cover of The Black Crowes’ debut album Shake Your Money Maker. After interviewing Zappa – who Tom remembers as “a strange character but quite likeable” – Tom gave him a Radio Clyde t-shirt. Soon afterwards a famous poster went into circulation, featuring Zappa wearing the Glasgow station’s logo on stage. 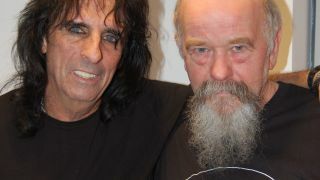 Tom Russell: The Godfather Of Rock is published by Beard Books on October 26. Find out more at www.tomrussellrocks.com.